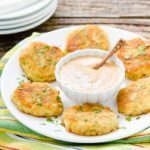 Mini Potato Crab Cakes are a wonderful appetizer. They are made with leftover mashed potatoes, lump crab meat, fresh lemon, herbs and seasonings. Stir together potatoes, egg, 1 tablespoon bread crumbs, 1 tablespoon flour, shallot, parsley, lemon zest, lemon juice, salt, and pepper in a large bowl until combined. Add crabmeat and gently stir to combine. Shape into 20 patties, about 2-inches wide. I used a large cookie scoop (about 2 tablespoons) to scoop out even amounts for each patty. Stir together remaining 1/4 bread crumbs and 1/4 flour. Coat patties with crumb mixture and shake off excess. Place patties on a baking sheet and chill for 1 hour. Put enough oil in a large skillet or sauté pan to coat the bottom. Heat oil over medium-high heat to about 350°F (you can tilt the pan and use an instant-read thermometer to check temperature). Cook potato crab cakes a few at a time until the bottom is browned, about 2 to 3 minutes. Carefully flip cakes over and lightly press down with a spatula until the patties are about 2 1/2 inches wide. Cook cakes until bottom is browned, for 2 to 3 minutes. Transfer cooked cakes to a plate or tray lined with paper towels to drain. Add more oil as needed between batches. Serve warm with remoulade sauce. You can keep cooked potato crab cakes warm by placing in an oven with the oven set to warm or on the lowest heat setting.